The monsoon is not just red earth and pouring rain, it defines the sky music of India. It washes the treetops fresh and draws rivulets through the hillsides. The monsoon is not just red earth and pouring rain, it defines the sky music of India. It washes the treetops fresh and draws rivulets through the hillsides and deepens the roar of waterfalls as the traveller on the narrow road sees no sign of the journey ending. The road keeps twisting and turning, hugging the sides of small hillocks or going right through them. A mild, cool breeze is a playful companion while sun plays hide and seek with the clouds, which alternately sprinkle the earth and open to bucket down torrents in true monsoon style. It is tea country, the seemingly endless green of the estates covering the undulating land along the Kerala-Tamil Nadu border near Wayanad. As one state segues seamlessly into the other and the border blurs, the narrow road climbs up heading towards Gudalur in Tamil Nadu. On the way, scattered in between are little hamlets and villages hiding in valleys; the only sign of life being smoke rising from an occasional chimney. In a school yard, a dozen-odd young boys brave the rain and are playing a noisy game of marbles, their shouts ringing out in the serene mountain air. 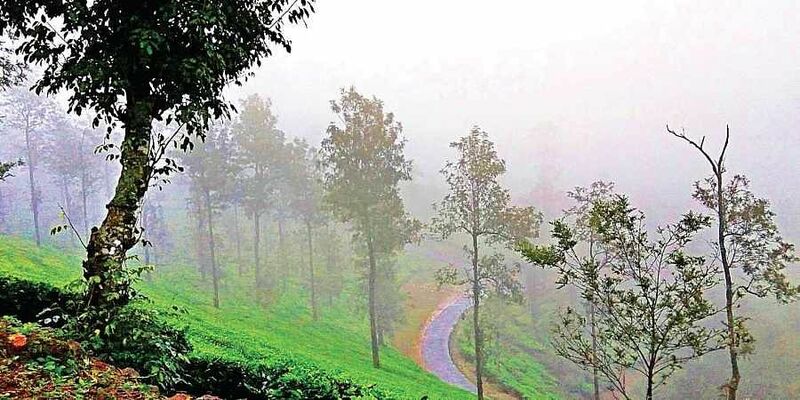 The road gradually snakes up to crest into a little plateau on which perches a charming over a century-old bungalow built when tea estates were run by British managers. But this one is different. Called Sinna Dorai’s Bungalow, or the house of the Junior Chief, it refers to the title of the estate manager who lived and oversaw the plantations. The squat building has a gabled roof, a patio and a running porch on one side with comfortable wooden furniture. Inside, a spacious living room, large dining room and the various bedrooms are furnished with period pieces, most of them from the Colonial era. The isolated bungalow stands like a sentinel on the hilltop, the monarch of all it surveys that slopes away in all directions. The monsoon is a constant presence at this altitude playing conjuror; the bungalow is one moment clear and then the next gets swiftly blanketed by thick cloud cover as the rain keeps up its relentless rhythm all through the evening and well into the night. The next morning, the sight from the verandah is gasp-worthy. From the bungalow’s hilltop heights, a panorama of verdant greenery, washed clean by the heavy rains of the previous evening is laid out like a green feast. All round are rising hills and falling valleys, covered with mist and clouds in various places. It is tempting to spend the whole day stretched out on a lounger, watching the natural drama unfold, but it is also too perfect a weather to waste and calls for long, ambling walks with an umbrella. Stepping out into the midst of the unending carpets of tea, the crisp quality of the air immediately registers. The locals caution against wild elephants, which routinely stray in from national parks that border the tea plantations. When the weather becomes kinder in the afternoon, a nearby tea factory is the right cup of tea. The air thrums with machinery permeated by the aroma of leaves in various stages of processing. The little cafe outside is inviting enough to watch the rain lash the windows. The magic of monsoons, experienced amidst green oceans from a timeless home, is quintessentially Indian.